We are a leading Exporter of cavity filler ball valve, cavity ball valve and cavity filled ball valves from Pune, India. The Sankey Cavity filler ball valve can handle a vast variety of fluids, semisolid and almost any viscous media inpaint pulp, paper processing, FDA, Paint and process industries. Our zero cavity valves have a unique design in which a PTFE / MPTFE / CFT / Metal Cavity Filler are used to fill the void in the valve cavity between the body, ball and seat. These cavities reduce the chances of residual particle contaminating multiple use line. 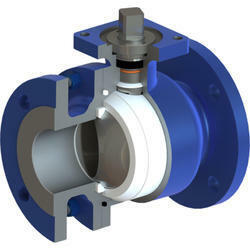 They are also used in slurry service and process that could solidify if left in closed valve body. These valves are only available in Full Bore construction. These rugged, versatile and high performance ball valves can meet NACE specification.